Kids love building and decorating gingerbread houses, but baking your own gingerbread and constructing the houses can sometimes be difficult and time-consuming. Save yourself some of the trouble with these easy "gingerbread" houses made from graham crackers and no-cook frosting. You can make just one for your family, or build a batch of them and throw a gingerbread house-decorating party, where each child decorates a house and takes it home at the end of the event. This no-bake method of making gingerbread houses cuts the prep time tremendously allowing you time to spend more time on the flourishes and details on your house. If you are having a party and you have a lot of houses to build and excited kids to entertain, these easier versions are the perfect recipe for a fun (but messy) winter holiday party. Make sure to have a drop cloth in your workspace. Fill your piping bag (or decorating bag substitute) with royal icing. Using the serrated knife, saw off the top left and right corners of a quadruple cracker to create what will be one of the house's gables. Repeat with another quadruple cracker. Place one double cracker on the table and pipe icing along all four edges. Working quickly, place the house's four walls (including the two with gables, which should stand across from each other) onto the icing and pipe more icing where the crackers touch vertically. Pipe icing along the top edges of the house and rest the two remaining double crackers on top of it to form a roof. Allow time to dry and harden. If having an entirely edible creation is not a priority for you, you can use a small milk carton as the base of your building. To make your house simply glue the graham crackers to the sides of the container. This will provide a sturdy base on which the kids can create their homes. 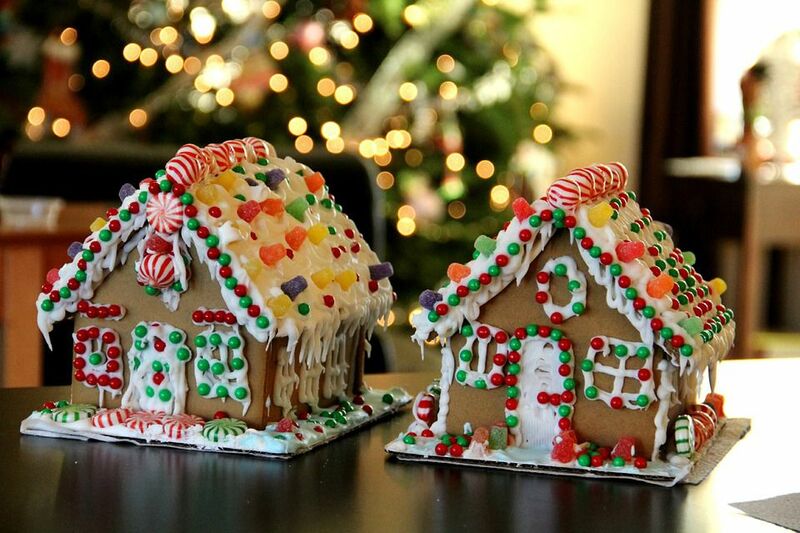 Once it is time to decorate, set out candy and give the kids some gingerbread house decorating ideas. Each child should also have an individual plastic sandwich bag of royal icing that is tied off and has a small hole poked in one corner to use as a gluing tool for the adornments. Write the name of each child on a paper plate and place the finished houses on the plates as they dry. Once the party is over, you can wrap them in plastic cling wrap and the kids can take home their creations.